In January, 1,530,441 passengers flew with Norwegian. This is an increase of 24 percent compared to January 2013. The total passenger traffic (RPK) increased by 50 percent and the total capacity (ASK) increased by 45 percent this month. The load factor was 74.8 percent in January, up 2.6 percentage points. 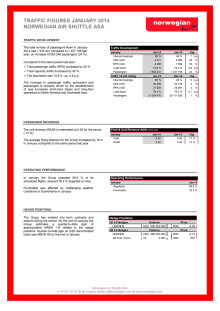 “I’m very pleased that we in a low season month like January increase the load factor, even with major capacity growth. The fact that 1.5 million passengers chose to fly with us prove that low fares and new, comfortable aircraft are important, “said CEO Bjørn Kjos. 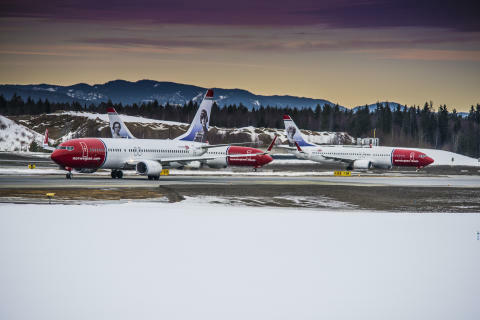 Norwegian operated 99.6 percent of its scheduled flights in January, whereof 78.3 percent departed on time. The on-time performance is affected by challenging weather conditions in Scandinavia. In January, Norwegian took delivery of two brand new Boeing 737-800 aircraft. A total of 15 such aircraft will be delivered in 2014 in addition to four 787 Dreamliners. 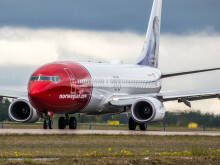 Norwegian’s fleet is one of Europe’s newest and most environmentally friendly. Norwegian Air Shuttle ASA, commercially branded “Norwegian”, is a low-cost airline listed on the Oslo Stock Exchange. Norwegian is the second largest airline in Scandinavia and third largest low cost carrier in Europe. 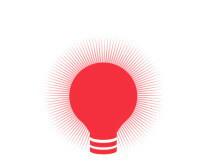 More than 20 million passengers fly on its network per year. Norwegian has a route portfolio that stretches across Europe into North Africa and the Middle East, as well as long-haul flights to the US and Southeast Asia. The company has a total of 413 routes to 128 destinations and employs approximately 3,500 people in Norway, Sweden, Denmark, Finland, Estonia, UK, Spain and Thailand. The company has 275 undelivered aircraft on firm order. Norwegian was founded in 1993 and its headquarter is in Fornebu, Norway. In 2013, Norwegian was voted Europe’s best low-cost carrier of the year by the renowned SkyTrax World Airline Awards. Norwegian offers better leg room than most competitors, in-flight WiFi, world-class punctuality and a fleet of 87 aircraft with an average age of only 4.8 years.